Home> Tech >How about a fresh cup of Coffee Lake? How about a fresh cup of Coffee Lake? It’s that time of year again. Before you could say, “7th generation core processor unit”, Intel’s ardently awaited 8th generation commercial desktop chips are already upon us, less than a year after its predecessor. We know new isn’t always better – how about an evolution? Coffee Lake, the latest addition to the Intel processor family - with names that spiral more perplexing every launch - will be the CPUs powering the desktop computers going on sale before Christmas this year. Industry concern has been that the chips have been released eagerly, without any noticeable changes to the actual CPU technology, more a roaring of the horn to hark an impending clash between the Silicon companies and their latest, most powerful CPU's. But Intel promise something more. Something worth the fast release this year. 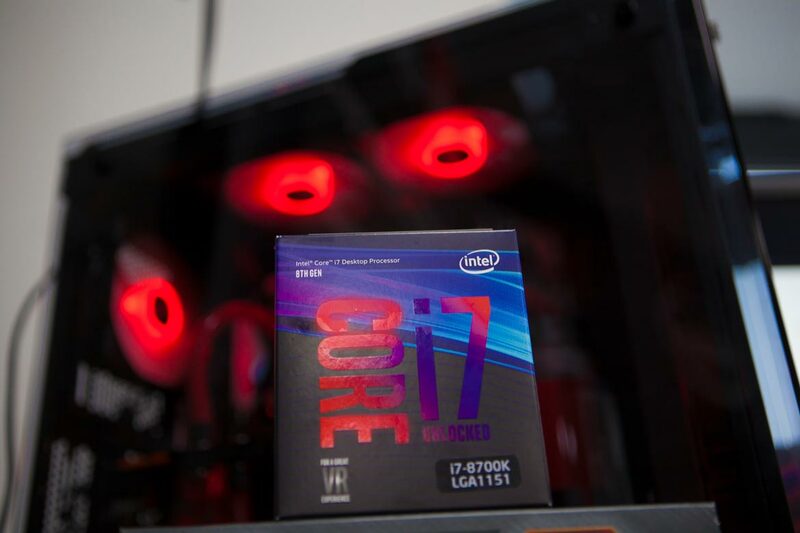 Striking an impressive first in their retail market, Intel has unleashed consumer processors that beat previous releases by adding between four to six cores – two more than their last generation, and the first time Intel has increased its mainstream core count in over a decade. That’s a 50% increase in the number of cores. It’s obvious that moving forward has been the key objective for Intel. Just skimming the surface of these new processors speaks wonders. Can you imagine the possibilities for overclocking now? We certainly can. In less than a year, this massive development see’s Intel’s mainstream chips evolving, blossoming past the conventional quad-core’s, whilst tackling Intel’s multi-threading processor redundancy by adding this serious kick to its advanced model. Although this may seem like a lag behind AMD’s own Ryzen components, the quality of Intel’s individual silicon has always spoken for itself. An improved focus on boosted Turbo speeds and sleek architecture optimisation refreshes last year’s Kaby Lake chips. The sugar in the coffee is that each individual core can be overclocked, but also means the power consumption will be higher by four Watts, plus what you’ll be adding from the overclocking. Coffee Lake processor’s promise an increase in the current capabilities of previous Intel desktop platforms, expanding on past features with advancements that see exciting and innovative ways to produce and experience content. The best part: Intel promises up to a 40% performance boost over the previous 7th generation Kaby Lake chips from only last year. - The Two Core i7’s knock previous versions out of the ball park, even from 2016, with 6 cores and 12 threads beating its previous 4 cores and 8 threads. - Core i5 8600K has 6 cores and 6 threads; the i5 8400 has 6 cores and 12 threads. - Instead of just two, the affordable Core i3’s have 4 cores and 4 threads for its Coffee Lake components. Through a fusion of previous technologies and innovative improvements, Intel designed the Coffee Lake to operate virtual reality gaming, 4K video, and 3D visual features. Note the focus on HDR Ultra HD video, streaming, and gaming that will be perfect for all-purpose gamers and those that use media editing. Users can also easily adjust the memory latency for those scenarios where memory speed may be crucial. Although the processing architecture of Coffee Lake itself has been changed little, a small step from the previous 7th generations Kaby Lake, it has been slimmed down with a smaller production process that creates a more efficienct resulting chip. Intel has made sure to keep their competitive prices at a steady rate this autumn. The most expensive i7 model has 6 hyper-threaded cores, with a 3.7GHz clock speed and a Turbo peak of 4.7 GHz for the ultimate performance – if you demand. Those looking for a more casual, mid-range chip will find suitable equivalents for a steadier price with the same solid speeds, though a few variations won’t handle hyper-threading. The biggest criticism of the Coffee Lake CPU is that it is incompatible with older series motherboards because of a change in their processing chips' pins, meaning they won’t configure with their sockets. This is a hardware issue that isn’t as simple as software updates; Intel are riskily slimming their market by catering to those looking for frequent advancements in hardware. But who? This is the fastest mainstream computer processing unit on the market. Perk ye ears, gamers. Some games are expected to have a 25% higher frame rate. The mind-melting experience that is Player Unknown: Battlegrounds will have 45% better performance. And with either an advanced air-fan or basic liquid cooling system, these numbers could be pushed even higher. Time (or you) will tell. Whilst Intel have steamed forward with updating its core count, they have still remained sensible enough to reign in on the upgrades just for the sake of headlines, making for a sleek, confident processor. Most PC games, in general, won’t benefit from a core count higher than 4. Utilizing the chips full potential lies in the individual user and their preference of game. The 8th generations incompatibility with past motherboards shows us where these chips are heading rather than settling. The Core i7’s hyperthreading means you will be able to address twelve concurrent threads - technology reserved for high-grade counterparts - taking these processors to another level. More and more multi-cored processors will soon be optimized. The technology is continuously evolving and this release delivers more power at the same price. Despite seemingly swooping into the limelight at a rapid pace, upgrades like these are developed to keep up with and challenge the PC user's who require higher power usage or greater game performance. If this resonates well with your techie-conscience, you have some upgrading to do. Phew. After all that… I need a Coffee.